The objective of this field study was to evaluate the performance of a Geotube® dewatering system under field conditions by quantifying the mass removal efficiency of solids, nutrients, and metals from well-mixed dairy-lagoon slurry dewatered by this system. 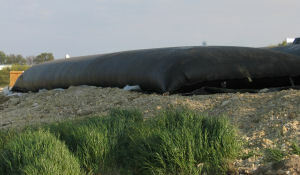 A Geotube dewatering system was set-up to treat the lagoon slurry mix from the primary lagoon of a 2000-head lactating cow open-lot dairy (Fig. 1). After two synthetic tubes were filled to a height of approximately 1.5 m with the slurry mixture (Fig. 1), the pumping of effluent ceased and tubes were left to dewater for six months. During the pumping of slurry mix into tubes, both alum and polymer were added. Slurry samples were collected before pumping it into the system (hereafter influent, IF), after mixing it with alum and polymer (hereafter IFCM), and effluent (hereafter EF) samples were collected as it ‘drained’ out of the system. Additionally, residual solids (RS) samples were also collected after both tubes had dewatered for six months. Samples were analyzed for solids, nutrients and metals following EPA and standard analytical methods. Figure 1. 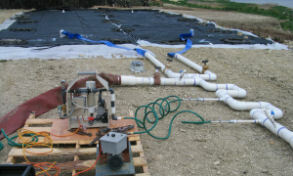 Geotube® dewatering system: before (L) and after (R) filling with effluent. This system effectively removed high percentage of total phosphorus (TP), 97% (Fig. 2) and soluble reactive phosphorus (SRP), 88% (Fig. 3), well above 50% reduction goal set by the phosphorus Total Maximum Daily Loads (TMDLs) for the North Bosque River in east central Texas. Geotube® also successfully filtered solids (95%) from the lagoon slurry. This system was less effective in removing K (<50%) (Fig. 3), since K is highly soluble. 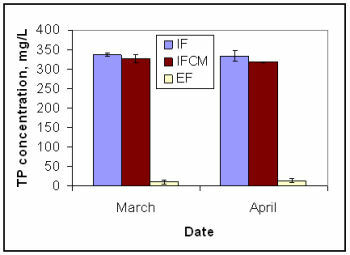 Geotube® dewatering system successfully reduced Ca, Mn, Fe, and Cu concentration by 91, 60, 99, and 99%, respectively (Fig. 3). However, this system was not highly effective in removing Na (<26%) from dairy lagoon slurry (IF). Figure 3. 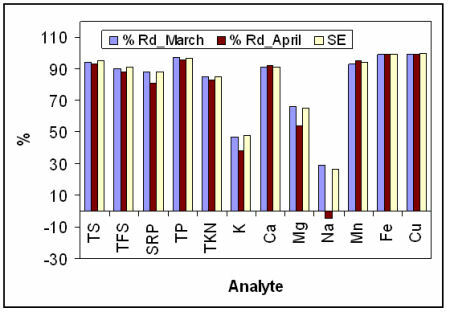 Average soluble reactive phosphorus (SRP) concentration at different sampling date. Figure 4. Average % reduction (Rd) and separation efficiency (SE) of effluent constituents using Geotube® dewatering system. 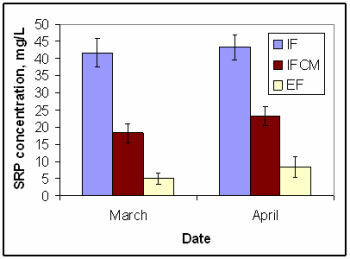 Water quality degradation due to phosphorus (P) contribution as a non-point source (NPS) pollutant from effluent and manure applied to waste application fields (WAFs) is a major concern in the Bosque River watershed in east central Texas. Geotube® dewatering system can be used as one of the best management pactices to minimize pollution from dairy effluent to be applied to field, but it must address the disposal of solids and costs. Contact mukhtar@tamu.edu or (979)458-1019. For more information, refer to the following publication.